As promised, here is the engine telemetry from Saturday's run. I understand this will not fascinate everyone. Overall, I believe that if I keep these kinds of records, and compare back to them, I'll be better placed to spot issues long before they get out of hand and cause a problem on board. The top chart shows the RPM, while the bottom chart, on the same time-line, shows the engine temperatures for various key points. The big dip and zigzag in revs you can see just before 10.00 is John cursing some yachtie or other who crossed us! The revs zigzagging at 10.18 is John manoeuvring Lady Jane across the Itchen, so we can pick up our mooring. From 10.25 Lady Jane would have been moored up and we would have been concentrating on getting those lines snug. 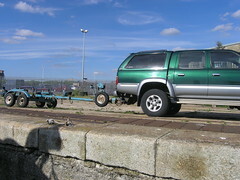 The red and blue lines represent the cooling freshwater which is circulated through the engine, while the green and purple lines represent the salt water which is pumped through the boat cooling the freshwater on it's way. The warmer the engine gets the more a thermostat opens, allowing the salt water to increasingly cool the freshwater. The thermostat is adjustable. The salt water also cools the turbo, so will always show a rise in temperature even if the thermostat is not opened. Looking at the diverging of the blue and red lines, and the raw data, it seems to me the thermostat starts opening at about 56 degrees, at about 10.15, the revs drop after that so the engine then cools somewhat. We definitely need a longer trip, and the missing pressure data, to give a better overall picture of the engine's performance. The good news is the issue on the new circuit board is fixed, so next time we go out for a spin I should also be able to show pressures. One thing this recent move has done, has encouraged me finally to upgrade the engine telemetry hardware. 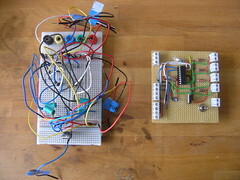 You can see the stark difference between the prototype on the left and the finalised board on the right. What had happened, was the old setup would work perfectly - until the vibration from the main engine caused intermittent connection issues, then the software could not cope. The new, upgraded, hardware is all soldered up, so vibration is no longer an issue. I'll publish the charts from Saturdays trip in my next post, for those who are interested. I only recorded rpm's and temperatures, as there was a small issue on the board that prevented the pressure sensors from working correctly. 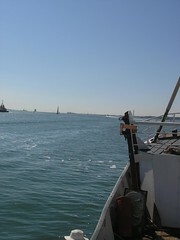 Here is the view down Southampton water as we sail from berth 50, back round to Lady Jane's mooring on the river Itchen. As you can see from the weather, it was the perfect day for such an adventure. Fortunately everything went exactly as planned, except maybe for a certain yachtie who got in our way, and now Lady Jane is safely back on her moorings on the Itchen. I don't know how many of you saw it, but the webcam was on for the duration. Special thanks to the crew, in no particular order, Chris, John and Fred who all helped participate in a trouble free jaunt. Today marks six years I've now had Lady Jane. Six years of work, learning, friendship and boat related fun! I've still not changed my opinion on owning Lady Jane - Knowing what I now know, I would never have bought her, but I have no regrets about doing so. The best part is sitting on deck with friends, in the sun, after a good days work. That warm glow of satisfaction of a job well done, and no more effort than hoisting a beer is required for the rest of the evening. 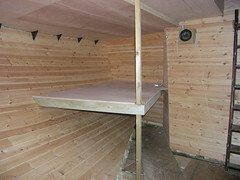 While Lee helped me with the RIB, Andy and Steve got on with creating bunks down below. In the original, grand, plan, during Saturday Andy and Steve would make the bunks such that everyone had someplace to sleep down below that night. The idea was that the frame and bases would be completed, with the sides and internals to be done some time later. In reality, the first bunk took so long that Steve ended up kipping on the floor. I should know things on board take more than twice as long as planned by now! Still, I'd rather have one bunk frame made really well than two somewhat wobbly bunks which would only need fixing later. As it was, we all only finished our respective jobs after eight in the evening. Time enough for a good feed and a few beers at an excellent Indian resturant nearby. A big thanks to Andrew, Steve and Lee for all the help over the weekend. Finally, the rib (HBI) is back in the water, as demonstrated by the empty trailer. Almost exactly two years after I took it out on account of the seized steering. Special thanks to Lee who helped with the antifouling and making a new seat for it. In truth there was not much impetus to get it back in the water, as the old sow cost less to run and to keep at the marina. Recent experience has shown that we need the pushing power of a bigger engine to point Lady Jane's bow in the right direction at low speeds, particularly when the wind is blowing the wrong way. With the impending move of Lady Jane back onto her moorings, the presence of the rib is suddenly highly desired. The empty trailer sitting outside my house serves as a reminder that I need to clean up the rust and paint it just how much fun it is to skim across the water at irresponsible speeds.